In March 1983, Don Durham and Teddy Garvin gathered a small group of friends together in Teddy’s living room and got them enthused about something new in the Gay world: square dancing! Gay square dancing started as an offshoot of the popularity of the “Urban Cowboy” rage. A chance gathering at the Reno Gay Rodeo of a few other Gay square dancers from around the country really got things going. Don had no experience teaching or calling square dance, but he had enough interest to keep on keeping on, teaching Dosados and Swing Your Partners along with the best of them. 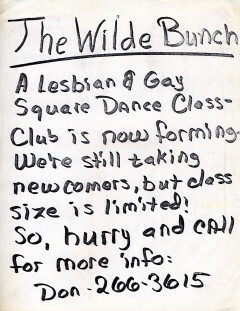 The Wilde Bunch’s first public location was Adam’s Den, an Albuquerque Gay Bar, then the group moved to the Albuquerque Social Club until 1996. Although square dancing isn’t normally choreographed for performances, the Wilde Bunch did its first public performance during Jon Hull’s “Caught in the Act” at the KiMo Theatre in June 1983, and had performed in this variety show every year until the last show in 2000. Over the years, nearly 700 people have been through the Basics of Gay square dancing in Albuquerque alone – that’s over 65 Basic classes. The Wilde Bunch is a charter member of the International Association of Gay Square Dance Clubs (IAGSDC®). It was one of the first clubs in the country to reach parity in the number of men and women members of the club, and has continued to have an all-inclusive policy for dancers. The Wilde Bunch club callers, Bill Eyler and Kris Jensen, both caught the calling bug early on in their square dance careers. Bill saw that first performance at the KiMo Theatre in 1983, and excitedly joined the next class. 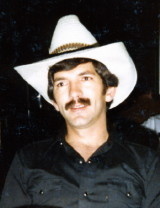 Bill became the club caller in 1984 after Don Durham moved on to Tucson to pursue his career. Kris was totally hooked after her first fly-in in 1990 and also jumped right into learning to call. They have since become internationally recognized callers in both the Gay and straight communities. Both have received the Golden Boot Award, a peer award presented at the annual IAGSDC conventions which draw 1,000 or more dancers from around the world. 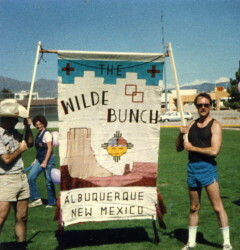 The Wilde Bunch has participated for many years in the annual Albuquerque Gay Pride celebration with walking performances, booths at the PrideFest and performances at New Mexico Expo. The Wilde Bunch has been dancing regularly one or two nights a week at the Albuquerque Square Dance Center since 1996. Along with classes, the Wilde Bunch has monthly dances for all its members and special events – even the occasional performance. Having just celebrated its 25th anniversary, the Wilde Bunch looks forward to many more years bringing to Albuquerque the fun of Friendship Set to Music!